You could also greatly help the CreationWiki by linking to us on your website, or by promoting the Creation Wiki to organizations, websites, or forums that are relevant to creation apologetics. Site ranking by search engines is largely determined by the number of incoming links. By submitting the CreationWiki address to other sites on the internet, our pages will be more likely to appear on search engine results. Consider using one of the CreationWiki logos when promoting the CreationWiki on other sites. The Northwest Creation Network is the founder and principal funding organization of the Creation Wiki. The Creation Wiki originally began as part of the parent NWCN website, but it was later decided that the CreationWiki should have its own server and domain name. Donations are accepted by the NWCN, and may be earmarked for dedication to support the CreationWiki project. The Creation Wiki is a valuable information source that is growing to become one of the most important research tools available to the creationist community. Currently, there are 9,223 articles on the Creation Wiki with 6,334 written in English language. Statistic Details: As of July 2015 there are 27,460 total pages in the English database. This includes "talk" pages, pages about CreationWiki, minimal "stub" pages, redirects, and others that probably don't qualify as content pages. Excluding those, there are 5,996 pages that are probably legitimate content pages. 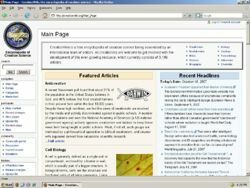 There have been a total of 305,606 page edits since CreationWiki was first set up. This page was last modified on 5 June 2018, at 00:06.